Fortnite fans are always on the lookout for fun new Limited Time Modes that Fortnite hasn’t seen before. This one from Besart17 would keep your duo partner on a short leash and keep you two fighting together. The name for it is “Attached Duos” and it sounds like a ton of fun. We have all had the duo partner who is known to wander off so it would be funny to see how games developed when players couldn’t get much space. There are a couple of issues with this introduction to the concept but that could be easily remedied. The doing damage when out of range seems like it would be difficult to deal with and could get frustrating quickly. It might be better to actually strictly enforce the distance between the two players so they physically cannot move a certain distance away from their partner. This would prevent trolls in the mode who would drop in and just kill their partner for fun. 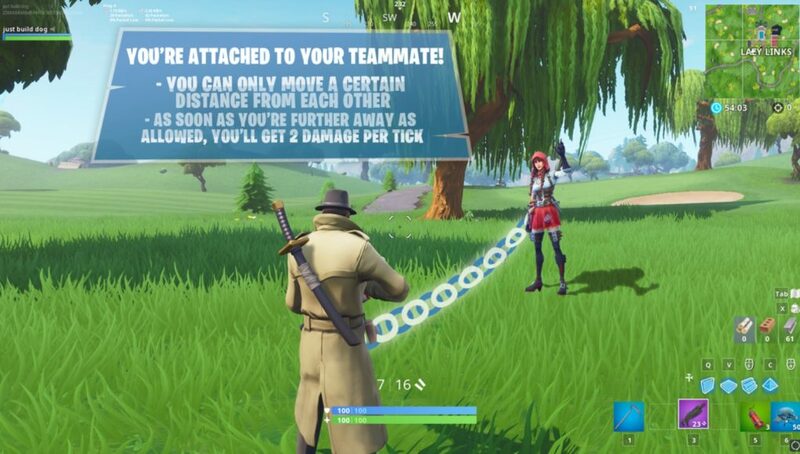 It also would promote the physical link and make teamwork more necessary, as it should be in this mode. The other change I would make is having the distance shorten with each circle. When at the beginning of the game players need to split up a little bit in houses to find loot. By having the chain get tighter players would have a chance to loot but then would be fighting nearly side to side by the end of the game. What do you think? Would you play this LTM?